The OMG That’s Chic designer is on a roll producing some beauties….here is another one!!! 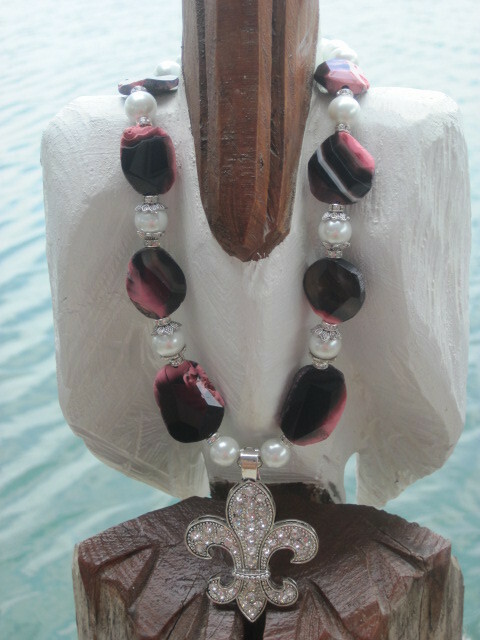 You have to love the black and pink agate beads accented with white glass pearls with silver tone bead caps accenting some of the pearls. The pendant is a beautiful rhinestone “blinged out” fleur de lis that is magnetic so you can wear it on another OMG That’s Chic necklace. The necklace measures approx. 18 ½’ and secured with an “antique look” base metal toggle.